Flying vegetables anyone? Have fun making food art with your kids and increase the likelihood of them eating more veggies. Let their imagination and appetite take flight with this twist on ants of a log -just add celery, carrot, bell pepper and fun! Have kids help wash veggies. We keep a fruit and veggie scrub brush by the sink, it’s an easy task to scrub and gets kids involved. Put nut butter along the inside of the celery. Then place passengers in the nut butter. Use raisins or craisins for the passengers. Don’t worry if kids get a little messy or a passenger or two falls over – just say he/she is sleeping. Have your child help you cut the bell pepper for the airplane wings. Young children can use a plastic knife. Discuss the shape first or cut out an example for them to copy. Save the tinny tip of the carrot for the very front of the propeller. Cut the carrots in circles (3) for the wheels and to for the circular shape behind the propellers. Cut 3 rectangle shapes for the propellers. Using tooth picks assemble the wheels and propeller. You can use nut butter to stick on the wings, but may need a tooth pick to reinforce them depending on the consistency of the nut butter. *Be sure to purchase toothpicks that obviously stand out with color, like the toothpicks featured so little kids don’t eat them when eating their veggie airplane! 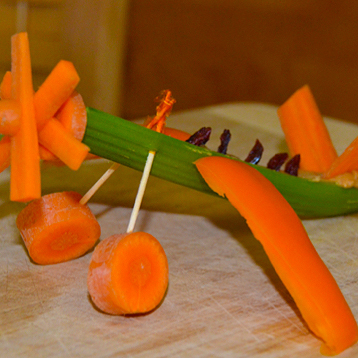 Take a picture of your flying veggies then eat your art!